One of the perks of BlissDom'09 that I haven't told you about is some of the fabulous swag that we got. With sponsors like Disney, Little Debbie, and Lands End, I knew it'd be good. 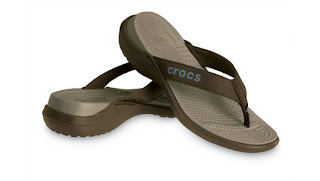 One of the surprises in our swag bag was a Crocs gift certificate. My first exposure to Crocs was in 2004, in California, where my dear friend Melissa sported the original classic in orange. Melissa is one of the coolest people I've ever known, and therefore, Crocs were cool, in my book. I balked at the price tag, though, and never gave in to the hype. Then, this past Christmas, I received these Mammoths as a gift. 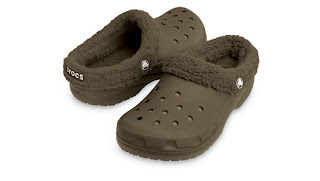 So, when I saw the gift certificate for $50 worth of Crocs merchandise in my BlissDom swag bag, you better believe I booked it to their website to pick me out a new pair. Okay, I didn't exactly "book it." I waited a couple weeks until I stumbled across the paper in the bottom of my day timer. I love those flip flops! I may have to go check them out for myself! Yay for swag! I'm an avowed non-Crocs kind of girl....but I definitely agree that those flip flops are cute. And very perfect for swollen summer pregnancy feet. Hey girl. Glad you are well and enjoying the South! Another Welcome my friend. :) Glad your pregnancy is going well. Loved your BlissDOM recaps. :) Amen that that. you won the feather and egg prints from L. Herbert Designs. you lucky duck you. Watch out--the sold out and you might be attacked by an angry mob of egg lovers! Can you email me so I can forward your address to Laryssa? Today's blog, brought to you by the letter "M"